Spring is here and soon everything will be all about flowers and nice weather, nothing better to welcome the new season than making a Spring Quilted Hoop. Easy and fun to make, basic applique stitch to do the flowers applique and simple embroidery stitches like buttonhole and back stitch. After you finish it, I’m sure you will be making a second one to give it to that special person in your life, whether is your mom, your daughter or your best friend, it will be a beautiful way to let her know how much you care for her. Small pieces of cotton 100 % fabric in different color and prints for the applique. Pins, safety pins, needle, scissors. You can take a look to the best quilters tools I use to create my quilts, embroidery and more, here. You can download the FREE pattern here and print it out twice. You’ll be happy you printed out twice because you can use one copy to use it to trace the pattern on the fabric and to cut out the templates. The second copy, you can save it just in case you want to make the Spring Quilted hoop again later. As the first step after you get your copies printed out, it’ll be to place the copy under the fabric, you can pinch two or three pins to keep the paper and the fabric in one place as you work to copy or trace the pattern on the fabric. To do this step, the best way to do it will be to place it on a window with day light and trace the pattern on the fabric with a pencil or a pen for fabric. Once you finish tracing the pattern on the fabric, you can take out the pins. On this step, you’ll be working on the applique, as you have been working on a few projects with applique, you might know how to do it. Cut out the patterns from the FREE pattern copy, and place the templates on the color fabric that you will use for each piece of applique and cut each piece from the fabric adding 1/4″ for the seam. This time, you won’t trace the pattern on the fabric as you cut out each piece, as the piece is already traced on the fabric. You can work on each piece as you work on the applique. Beginners Tip: if this is your first try to do the applique, you can watch one of the videos where I explain more about how to do the applique. Most of the applique on quilts is made the same way, as you learn how to do it for the first time, all you need is to do the same steps to do the applique on each quilt you want to make. Once you finish all the applique, it’s time to trace the lines for the hand quilting, this time you will need to trace the lines out of the applique. Trace the first line and then keep tracing the following lines 1″ apart with the patchwork ruler. You will need to trace also the shape of the hoop on the fabric, this way you’ll be quilting only the lines you need to quilt. Lay the batting fabric under, and pinch a three safety pins. You can do the hand quilting now. On this photo, you can see I already finished the hand quilting, and I place the hoop on the project to trace the shape of the hoop on it. Make a running stitches on the circle you traced of the hoop. Turn your project up side down, and with the help of the scissors, trim the batting fabric. The running stitches will help you to trim out the batting fabric. It’s time to put your quilted project on the hoop and do all the embroidery. On the video you can see how I did the buttonhole stitch on the flowers, I also did X stitches on the leaves and on the flowers center. I also did the small red circles applique with no seam, I just did the applique of each piece with buttonhole stitches. On the leaves I did back stitch embroidery. I worked all the embroidery stitches with a single thread of polyester 100 % thread in gray color. This is how your project looks like when you finish trimming the batting fabric, you need to trace the inside circle of the hoop on a fabric you pick for the back of the quilted hoop. Trace the inside circle on a fabric and cut out the piece from the fabric adding from 1/4″ to 1/2″ for the seam. Make little cuts on the seam all around the circle. On this photo, you can take a look on how the embroidery looks like on the back. This time you don’t need to add a fabric for the back when you do the quilting or the embroidery, as this part will be hidden with the fabric circle. Trace 1″ all around the circle you traced to do the running stitches and trim out the fabric. With a single thread on the needle, make running stitches on the edge of the project. Place your project on the hoop and pull the thread to gather the fabric, and make a knot to keep the fabric gathered. Cut the thread out. Place the fabric circle on the back of the hoop and pinch a few pins to keep it on its place while you do the applique to stitch it to the fabric on the back of the hoop. 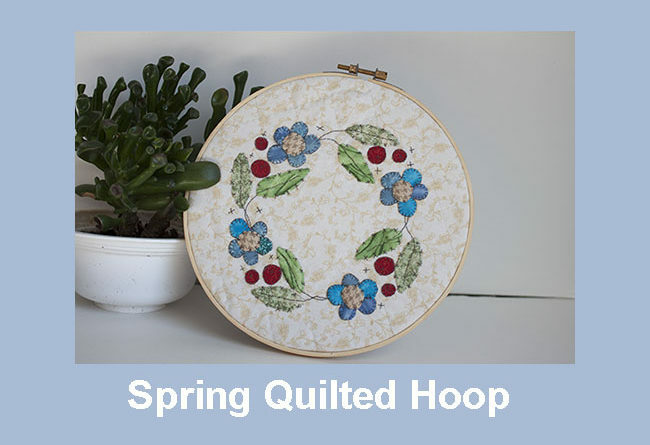 You finished the Spring quilted hoop, all you need to do now is to sew a plastic ring on the back or make a button hole with thread as I did on the video, it will help you to hand the hoop on a wall. This is how the Spring quilted hoop looks on the back after you finished the applique of the fabric for the back. Congratulations it looks amazing and it will help you to decorate any place in your home or on your work place! Quilted hoops are easy to make and they are always nice to have them anywhere to add a cozy touch to a home! They are also easy and fun to make as a birthday present for a special person in your life! I’m sure after you make the first one, you’ll want to make at least one more to give it to your daughter or to your mother or to your best friend! Don’t forget to show me your Spring quilted hoop after you finish it, you can always share a photo of it on your Social Media and add the hashtag #patchworkwithalex so I can give you a like or a heart! I will love to see your Spring quilted hoop! 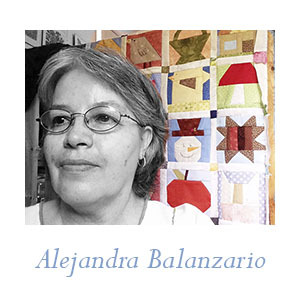 Follow me on my Social Media where I share some updates and moments of my work with quilts, embroidery and much more! If you want to make the Spring Quilted Hoop later, you can save this Pin so you can find this blog later.